Details, details, and more details are in every wedding. Every wedding has very interesting details. The ladies were laughing and enjoying their quiet time together. Music was playing in the background from their iPod. In between laughing and story telling, I asked the bride if she had something Something old, something new, something borrowed, something blue. Immediately, they began to gather up the items. I wanted a unique way of presenting the items and asked for a shiny platter. The bride's mom had one and my creative juices started. Utilizing multiple lights I was able to create interesting shadows which created the details that I like in these type of shots. This photo displays a little of each item. 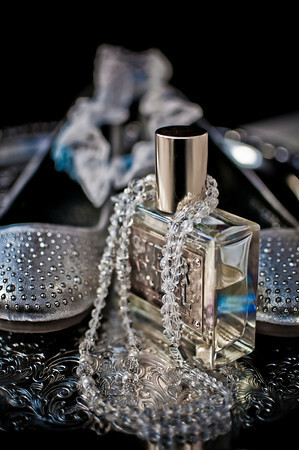 The perfume was borrowed and the necklace was used. However, it was all unique to the bride when combined together. As a photographer, capturing details is critical for many reasons. The bride might have dreamed and planned of this day since a little girl. Hours and hours of detailed planning goes into the wedding day and I do everything possible to capture the details. These detail shots are great for the album but they are also very nice for large prints to remind the couple of their steps taken in preparing for their special day. I envision this image framed in silver on metallic paper with black matting. Nikon D300 - Processed in Lightroom and NIK HDR efex pro .